I’ve taught second, third, and fourth grades, and third grade is by far the BEST. Here’s why! When people ask me what I do for a living, I proudly announce, “I teach third grade!” Often I get pity looks or responses such as, “I don’t know how you can do that all day! I never could!” Yes, it does take superhuman powers to be a teacher—any kind of teacher—but I’m pretty lucky. I’ve taught second, third, and fourth grades, and third grade is the best. Here’s why! 1. Third graders are independent. “I can do it myself!” Unlike kindergartners, first graders, and even second graders, you rarely have to tie shoes, zip coats, put on mittens, or unbutton pants because of a potty emergency. On the rare occasion that I have had to tie shoes, it immediately became that night’s homework. There is no shoe tying by the teacher in third grade! 2. You have an endless supply of funny stories. They provide LOTS of material for parties or stand-up comedy routines. Third graders overshare—everything! I know what Daddy really thinks of Mom’s new hairstyle, how loudly Papa snores, and also some things that made me quickly change the subject. (Time out! TMI! That your dad sleeps naked is not something you should share with the class! Try getting that image out of your head!) Yup. I’ve heard it all, and upon my retelling, people have been known to nearly explode with laughter. 3. They spread holiday joy. “Yes, Virginia, there is a Santa Claus.” Most of them still believe. There are always a couple that say they don’t, but you can see the longing to believe, and you can still help them experience the magic. They also bring really delicious holiday treats, adorable homemade gifts, and so many teacher or apple ornaments that you could open a gift shop on the side. Third graders are no longer learning to read, they are reading to learn. Of course, not all of them are. A student’s reading development is often as varied as children themselves. 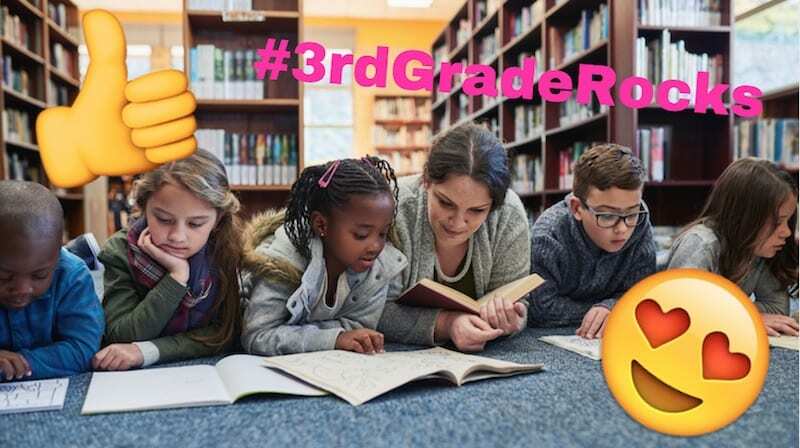 However, generally speaking, third grade is the year when they have developed their comprehension and fluency skills enough that they can really start thinking about their reading. No longer do they have to focus singularly on the letters and sounds that go together to make words. They begin to make connections, predictions, and inferences that go beyond the actual text. It’s so rewarding to see them get excited about their reading! “It’s not fair!” Third graders have a strong sense of justice and morality. It is evident everywhere—on the playground, in math centers, and in the lunchroom. Third graders love to tattle, but their tattling often involves relaying the details of a perceived injustice that has been inflicted on someone other than themselves. I call it third-party tattling! They are master rule followers, and I have had to dry many tears because “cutting in line is never okay!” Third grade is the beginning of their awareness that not everything is black and white, and yet there is still so much simplicity in their world—a world where “shut up!” is still considered as horrible as a swear word! 6. You get a daily dose of potty humor. Poop and potties and toots, oh my! Poop and potties are funny. They are! Third graders love stories like Captain Underpants, and they will roar if anyone says the word “duty” or, heaven forbid, toots in class. Being with third graders has shown me how to loosen up and break the straight-laced bonds of adulthood. It’s funny. Go ahead and laugh with them. It’s okay! 7. You learn lots of new jokes. Knock-knock. Who’s there? Third graders are expert joke-tellers. Well, not really. They think they are, and this is the age where they begin to try out wordplay, puns, and riddles. They tell a lot of really bad knock-knock jokes, but I always have a joke of the day and allow them to share. Understanding puns is a higher level skill, and even if we have to explain the joke, it exposes them to the subtleties of humor in our language. I just heard a new one: Why didn’t the lobster give any presents? Because he was shellfish. Get it? 8. You learn to love being sticky. Did someone say glitter? Third graders love to craft, especially with glitter and glue! Their inability to use restraint means that it’s very messy, but it is so important to foster their creativity and give them the freedom to explore and express themselves through art. However, I do not recommend making teepees with decoupage paper towels, any kind of slime, or lemon-sugar hand scrub. Epic fails! Trust me! 9. You become a rock star! Third graders still love their teachers. They will compliment you on your jewelry, outfits, and haircuts. They will be empathetic when your dog dies. Third graders will bring you your favorite candy—I have eaten my weight in Reese’s Peanut Butter Cups. They will call you mom by mistake. You have incredible power to positively influence their learning experience, and for some, being with you is the best six hours of their day. Third graders are full of love! 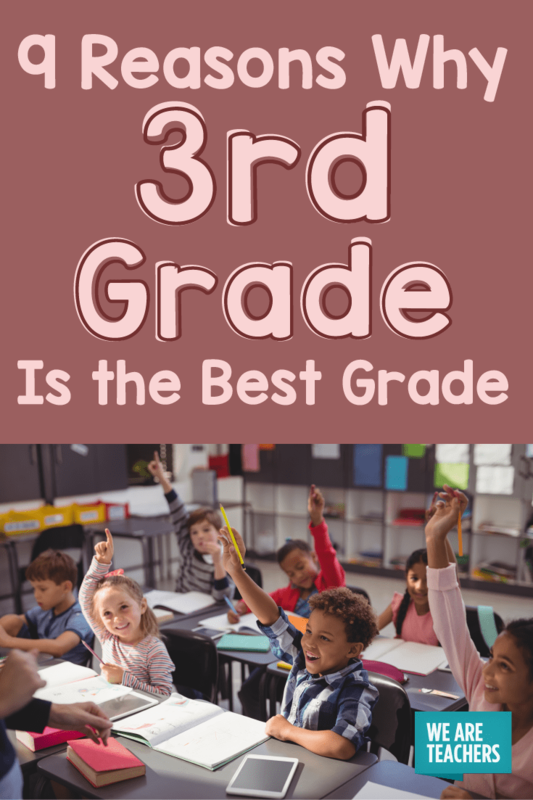 Do you agree that third grade is the best? Or does another grade have your heart? Come and share in our WeAreTeachers Chat group on Facebook. Plus, check out why teaching middle school is the best job ever. I have been teaching for 10 years, primarily 3rd grade, & in recent years only math! I love making math fun, especially for girls!!! I have an advanced certificate in gifted & talented, and really love creating in-depth lessons that push these kiddos further. I am a Maine girl through & through!